Where is waldo? LOL. Yeah, this shot looks incredible BIG on the wall (where it belongs). This has to be one of the Best Wedding Pictures in Miami. 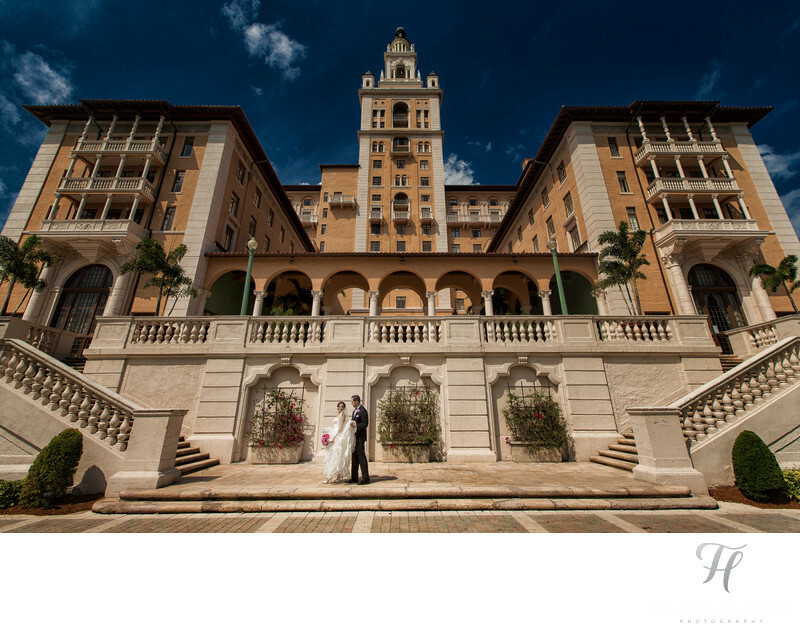 Here I am at the Biltmore Hotel again with Marjorie & Juan on their wedding day. We had just wrapped up some of the styled images near the big tree and were walking back to the hotel. I noticed, that the building itself was in perfect light. The sun, was –exactly– centered with it, and the shadows were totally even on both sides! This is something that is rare to just “catch”. So, I then posed them in a way in which they would not make contact with the camera (she is looking back at him, while he holds the dress) and I was able to get this landscape shot! Notice, I have my clients inside of the “dead space” on one of the columns and not near anything else. This was important, because if anything was of distraction to them.. it would not be as good (meaning they would have blended in with the bush), so all of the little important details come into play here to make this shot what it is. This shot is a good balance of luck, and skill. It was lucky that I happen to be there at the correct time for the sun, and it was skill that allowed me to see this and take advantage in the way that I did.